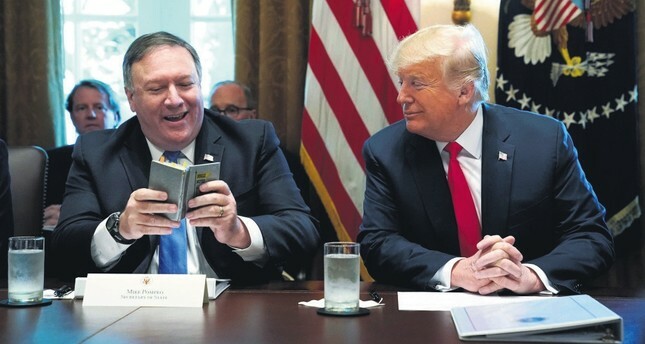 U.S. Secretary of State Mike Pompeo (L) and U.S. President Donald Trump look at Pompeo's West Point cadet handbook from his time at the U.S. Military Academy in the 1980s at the White House in Washington, Aug. 16, 2018. For the last several years one of the most frequently written topics in regards to U.S. relations with its allies have been the future of its partnership with Turkey. Many U.S. allies have been watching the relations between the two countries in order to understand the meaning of alliances in the evolving international system. The developments in the last few years generated less hope and more pessimism the alliance relations. In the last decade observers of American foreign policy puzzled about its main objectives. Increasing unilateralism in its approach, rising insensitivity to the national security concerns of its allies and lack of an effort to fix the weakening and breaking ties generated worries among the U.S. allies about their relation with the world's superpower. Almost every foreign policy analysts emphasized the emerging problems between the U.S. and its allies and rising problem of trust between these partners. However there was a lack of effort to recognize, understand and resolve these problems. In this period, the U.S. foreign policy makers did not show sufficient care and attention to their relations with their allies. They sometimes accuse the allies of free riding and sometimes they act or inact without consulting or discussing with the allies in some key foreign policy issues. Some of the allies started to have high levels of skepticism in regards to the U.S. commitment for the treaties they signed while seeing that U.S. foreign policy makers fail to fulfill some of the promises they made earlier. This problem continue to deteriorate with the emergence of new crises in different parts of the world. U.S. allies were frequently confused due to the differences in rhetoric and action of U.S. administrations. While reacting to different crises the U.S. allies had hard time to figure out the official position of the U.S. foreign policy due to the mixed messages coming from the different branches of the administration. In fact even some within the U.S. was aware of this worsening state of relations with the allies. During the election campaigns, throwing an ally under the bus has become an accusation to the U.S. presidents by their opponents or the opposition. Some of the contenders underline the loss of U.S. credibility and reliability in regards to its relations with allies. It was not only during the elections, some former foreign policy officials, those who knew about the value of the alliances and allies to U.S. power, influence and credibility around the world often warned about the potential impacts of this discourse and actions. Regardless of whether the administration picks retrenching or isolationism as its foreign policy doctrine, the allies still matter to provide international security and advance mutual interests. However these warnings and redflags so far did not change much..
Those who look at the U.S. alliance relations with Turkey in the last few years have more questions about the future of alliances. Failing to commit promises in Syria, supporting the People's Protection Units (YPG), not showing sensitivity to national security concerns gave serious damages to mutual trust between the two countries. In the last week the statements on Turkey by Vice President Mike Pence and the three different resolutions that were introduced to the Congress by lawmakers increased tension and stress over the ties between two countries. These statements and actions today being closely watched by other U.S. allies in different parts of the world. The inconsideration to strategic partnership and using a language that does not fit the spirit of alliance will make every U.S. ally in the world less confident about the future of its relations with the U.S. It is risky for the alliance system, damaging for the Turkey-U.S. relations and further disparaging for the U.S. image in Turkey.